I found this 4 cm long tooth on a beach in Brouwersdam "near" Rotterdam (North sea). Hi. I think it's probably a modern cow tooth. Hi and thanks for your help ! I don't see the presence of the stylid characteristic for bovid, or the pictures don't reveal that. 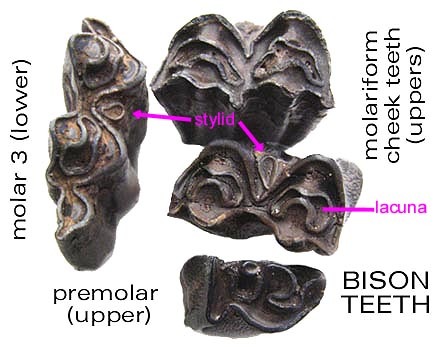 If the stylid is not present, I think it could be a camelid molar 3. What do you call a stylid ? I also don't see any stylid on that tooth. Do you have an pictures of a camelid tooth ? I'm not aware of camelid fossils coming from the North Sea. Well, If we've eliminated cow/bison and camelid, how about another bovid like goat or sheep? Thanks for the picture abyssunder ! So you think its modern ? I hope you found my images helpful. I think that it's not possible to say the age of a beach find in Northern Germany without knowing the species. The size is right for sheep/goat, but I don't have enough information to exclude several fossil bovids or even a giraffid. The probability is, in my estimation, that this is a modern tooth. The resemblance is good ! Thank you, Harry. I hope its not annoying that i ask another time ... Is it modern or fossil or is it "impossible" to say ? I don't know the history of sheep/goats in the Pleistocene of the North Sea region. You can research that as easily as I could. The probability is that it is Recent, but that guess is not dispositive.